Last winter TXLIHIS released “USDA Rural Housing Service in Texas: Turning Away from the Poor,” a report detailing how in 2009 Texas failed to take advantage of over $14 million in subsidized low-income mortgage loans. These loans are allocated to the state by the United States Department of Agriculture (USDA) Rural Housing Service under the 502 Direct loan program. This article takes a look at developments in the program since then. Shortly after the report’s release, USDA issued a press release reiterating support for the program. They also provided a week-long training for its Texas field staff on qualifying low-income families for this unique mortgage program and sent another press release highlighting successful families in the program to rural newspapers in April. We recently obtained (courtesy of the fine folks at the Housing Assistance Council) data regarding Texas’s utilization rate in the 502 Direct program in the 2010 federal fiscal year. In the first eight months of the 2010 fiscal year (i.e. through the end of May) Texas had already obligated $33.3 million in the 502 Direct program, up from $26.8 million over the entire 2009 fiscal year. Much of this improvement comes from loans funded by the American Recovery and Reinvestment Act (ARRA). This program appears to have finally gotten underway in earnest. 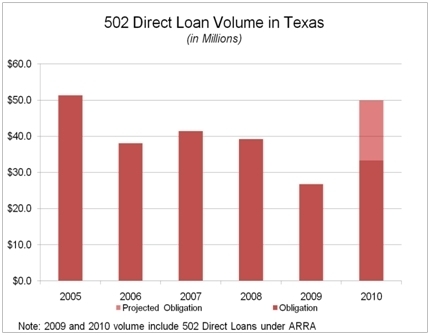 Last year, Texas made only 11 loans under the ARRA 502 Direct program. In the first eight months of this fiscal year, Texas has already done 132 ARRA 502 Direct loans. Some of this improvement likely comes from changes in the mortgage market in 2010 vs. 2009. Most notably, existing home sales are up in the market as a whole, while commercial lenders remain on the sidelines. As a result, government loan programs have captured a large portion of this rebound. Nevertheless, the volume of 502 Direct lending in Texas has risen more than in other states, supporting the hypothesis that USDA Texas’s increased outreach and attention is paying dividends. Last year Texas ranked 18th in dollar volume of obligations in the 502 Direct program. As of May, Texas had risen 5 places in the ranking, and now ranks 13th. While 13th in utilization is an improvement from the past, USDA estimates that Texas has the highest level of need for the 502 Direct program in the country. In fact, according to the allocation formula used to distribute the funds, Texas has 43% greater need than the second ranked state, North Carolina. Given the enormous need, and even with the recent improvements, Texas will leave funds unused. A gap remains between the state’s high initial allocation and its relatively modest utilization. One of the most valuable characteristics of 502 Direct loans is an interest rate subsidy tied to the borrower’s income. If a borrower’s circumstances change, (for example, if they lose their job or get a raise), the subsidy is reevaluated based on their new financial circumstances. As a result, this product is particularly suitable for very low-income borrowers. In our report last winter, we found that Texas fell short of the statutory requirement that 40% of the national volume of 502 Direct loans should to be made to very low-income borrowers. This shortfall continues: So far this fiscal year, Texas has made only 33% of its loan volume to very low-income borrowers. In response to our report, USDA and TDHCA have both designed new programs to build capacity in Texas to use 502 Direct funds. These programs are just now getting underway but have the potential to narrow the Texas utilization gap even further. The first initiative is a cooperative agreement between USDA Rural Development and a consortium of local providers affiliated with Texas Community Capital (TCC). This agreement is designed to increase participation in USDA 502 Direct loan program by expediting the loan approval process. Our report last winter found long processing times for 502 applications to be a barrier to the program’s use. The agreement calls for the TCC network of providers to package 200 loans in the 502 Direct program by September 30, 2010, including 100 loans for very low-income borrowers. This program is specifically targeted at 59 persistent poverty, colonias and underserved counties in Texas. This geographical targeting, along with the very low-income service requirement, has the potential to improve Texas’s performance serving very low-income borrowers. USDA has set aside $75,000 from the American Recovery and Reinvestment Act (ARRA) to fund the work by TCC and its affiliates. Because this program is funded through ARRA, loans made through this program must be obligated by September 30, 2010. USDA nationally recently indicated that they intend to allow loans to continue to be packaged for expedited processing after September 30th, but funding for the packaging will no longer be made available by USDA. Unfortunately, we expect the termination of the packaging subsidy to disproportionately impact Very low-income loans, as they are less likely to be able to cover packaging costs as an administrative fee to the loan. TCC recently had its first loan packaged under this program approved by USDA. The second initiative is the Rural Housing Expansion Program, a new program administered by the Texas Department of Housing and Community Affairs (TDHCA). Under this program, local providers can access the Housing Trust Fund to offset the cost of packaging and submitting loans to USDA. Providers can also access up to $5,000 for training and capacity building activities. The program has a $500,000 budget, although costs reimbursed under this program must be reserved in TDHCA’s system by December 29, 2010. The final Notice of Funding Availability (NOFA) for this program was approved in Mid-May, and TDHCA is now receiving applications from providers. Providers must be approved at a TDHCA board meeting before they can access the system to apply for funds for individual loan applications. While these two initiatives are separate, TDHCA has stated that they do not intend to fund the packaging of loans that have been already funded in full by USDA. Given the staggered end dates of the program and the overlap in providers expected to participate in the programs, we expect that providers will give preference to the USDA/ARRA program until September 30th, 2009, and will then turn to the TDHCA/Housing Trust Program through the end of the calendar year. One other recommendation in last winter’s report was to extend HMDA-equivalent reporting requirements to USDA for their Direct loan programs. While this could be done statutorily, we encouraged USDA to pro-actively report this information under the “Open Government Directive,” the administration’s initiative to proactively release high-value information held by the federal government. Unfortunately, there is no evidence that this initiative has been adopted by the Rural Housing Service in relation to the 502 Direct program. This information could and would be used by the community served by USDA Rural Development to monitor the success and equity of its Direct lending program, and we continue to urge for the proactive release of this data. USDA Texas’s new outreach and the new capacity building new initiatives hold promise to help close the gap between Texas’s need-based appropriation in the USDA 502 Direct program and its capacity to obligate funds. Nevertheless, the gap is large, and we doubt the entire shortfall will be made up by the end of the year when the funding for these programs expire. Both USDA and TDHCA need to be looking ahead to ensure that the momentum and capacity built by these initiatives is carried forward into 2011. We call for both agencies to evaluate, improve, and continue these programs. Without capacity support for loan packaging, Texas will continue to fail to serve very low-income borrowers with the 502 Direct program. This entry was posted in State issues and tagged 502 Direct, open government, Rural Housing Service, TDHCA, Texas Housing Trust Fund, USDA. Bookmark the permalink.